Name an executor, the person who will make sure that terms of your will are carried out. If you are still not convinced that you should draft a will, here is what will happen if you do not draft a will. In the state of Maryland if you die without a will your property will be distributed accord to the state “intestacy” laws. In Maryland this means that your property will be given to your closest relatives, beginning with your spouse & children. The list continues to increasing distant relatives, which can include siblings, grandparents, aunts, uncles, and even cousins. If the state cannot find a living relative by blood or marriage, the state will take the property. What is Needed to Finalize a Will in Maryland? To finalize a will in state of Maryland you will need the following. Yes, in your will you should also name an executor who will ensure that the statements of your will are carried out after your death. If you do not name an executor the probate court will appoint someone to take on the job of winding up your estate. While you do not have to use a lawyer, it is recommended that you do so. 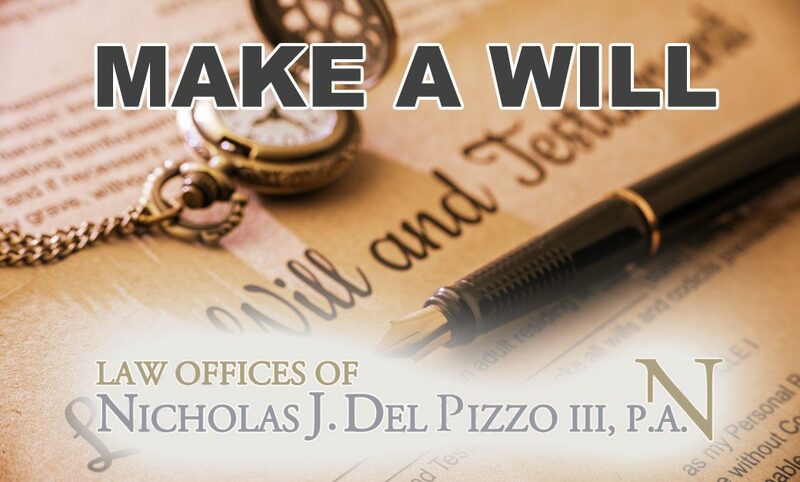 At the Law Offices of Nicholas J Del Pizzo we help our clients draft their will. For more information or to schedule an appointment with an experienced attorney please contact The Law Offices of Nicholas J Del Pizzo.